Where the dog supports the child’s emotional growth, dog agility makes an excellent activating hobby. Once on the track you cannot concentrate on anything other than the task ahead; your motion, obstacles and the dog. This challenges the handler like a mobile and computer games. That’s why Funna® works so well with the children. Adding motor skills and physics training to the traditional agility training, the Funna method will benefit the child for the rest of their life. 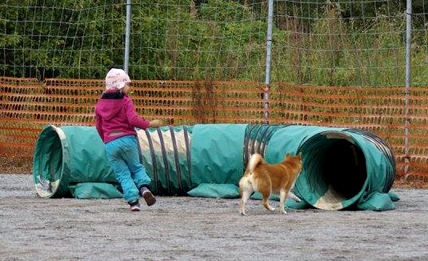 In Funna lessons, a skilled dog guides the child on the adventure to the agility. Sounds good? Come and try out! By joining our news letter, you will stay on track of our upcoming training! Try Our Body Control Exercise!